January 24 , by Barbe Saint John. Brought to you by the School of Beadwork, a wonderful beading retreat! Beads on the Vine – Enjoy aÂ unique beading getaway in California’s wine country. 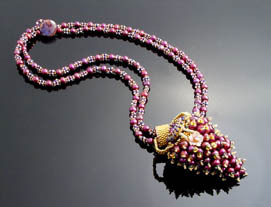 You’ll have the opportunity to learn a variety of new techniques from some of the most sought-after bead experts. While enjoying the breathtaking scenes Edna Valley Vineyard has to offer, you’ll catch yourself mingling with those who love beading just as much as you. Don’t miss out on this enchanting opportunity! Check the website for full details and to get on the mailing list.